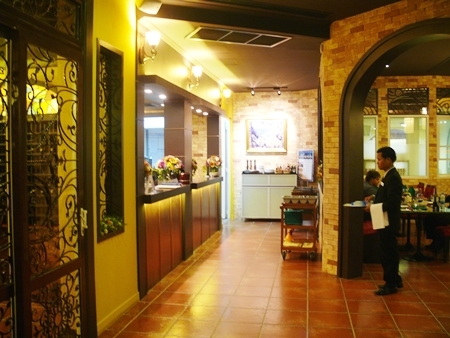 Is there anyone who has not seen the Ambassador City Na Jomtien? That enormous collection of buildings, which was once the largest hotel in the world. Well, it has lost that title, but is still the fourth largest at 4,200 rooms. I used to swear that if everyone pushed the flush button at the same time Mabprachan dam would dry up! A few years ago, the Ambassador City was looking a bit sad, to be honest, but after our visit last week, that has all changed. Many holidaymakers and 20 restaurants to attract them. We went to their Italian outlet, Pasta-Pasta, way down on the left side from the entrance heading towards the sea, and you will be as amazed as we were. Pizza-Pizza is fresh, vibrant and is so Italian you could be in Genoa. I chose Genoa as that is where Pasta-Pasta’s Italian chef Claudio Viale comes from, and he is passionate about his food and his restaurant. 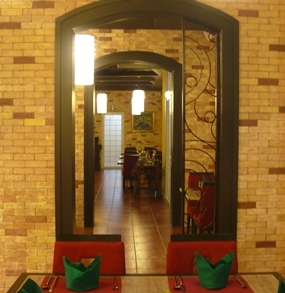 Terracotta tiles, archways and private alcoves, a traditionally styled pizza oven, red and green napkins and tablecloths and happy service staff will have you smiling before you have even looked at the menu! A glass of wine while making your choices always helps, and a glass of the house wine Mandrarossa Nero d’Avola from Sicily (B. 250 per glass or B. 1,200 per bottle) is very pleasant. The restaurant is in three main sections, with an open dining (air-conditioned) main area, leading into the alcoves section, whilst there is also an open air al fresco section for those wishing to enjoy the sea breezes (and a cigarette!). Wines are predominantly Italian (not hard to predict) and range in price from around B. 850 to B. 7,000 (though there is a Chateau Lafitte Rothschild in the cellar for something over B. 150,000). 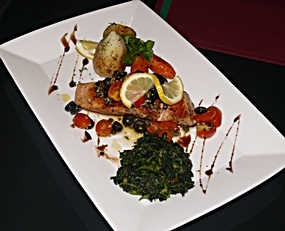 I have often found that you get the best out of an Italian kitchen by following the recommendations of the chef. Chef Claudio rose to the occasion, suggesting the mixed appetizer (B. 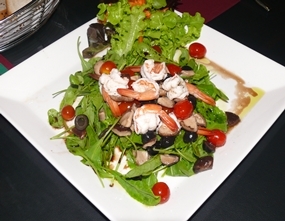 460 for two persons), a rocket salad (B. 280) with prawn (the Pasta-Pasta salads are hydroponically grown on site), a beef ravioli in truffle sauce (B. 390) and their 4 Seasons pizza (Shitake mushroom, salami, artichoke and ham). All pizzas come in two sizes – eight slice or four slice and are mainly in the range of B. 260-390 for the large ones. And of course Chef Claudio insisted we try his Tiramisu (B. 130) at the finish and a couple of glasses of his special grappas (try the Nonino, especially the chardonnay variety, just wonderful). 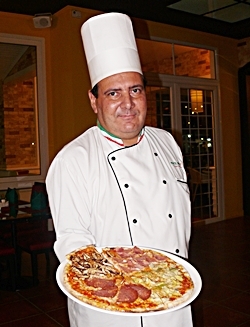 There is an old saying in the gastronomic world – “Never trust a skinny chef.” Claudio Viale is not skinny! Claudio also waxed eloquent when the subject of ‘real’ pizzas came up. “Thick bases with fillings in the rolled over edges are not pizzas. They are focaccia bread with tomato sauce topping.” The Italian chef from Genoa has spoken. We were quite frankly amazed at the difference between the present and how we remembered the Ambassador City from around 10 years ago. F&B director Prayoon Chaitosa showed us one of their other outlets, with five or six open kitchens, very modern décor and even a revolving stage. With the new road system, for us living in East Pattaya it was a leisurely 15 minute drive via the railway road. We will definitely be back, and I’d like to try their new Oyster Bar as well (hint, hint K. Prayoon)! 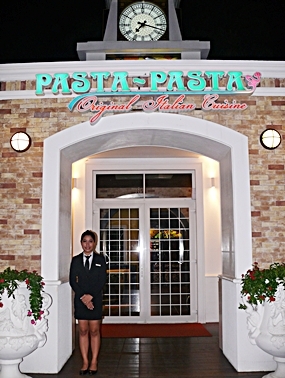 Pasta-Pasta, Ambassador City Na Jomtien, 21/10 M2 Sukhumvit Road, open 7 days, 11.30 a.m. till last orders 10.30 p.m., telephone 038 255 501, website www.ambassadorcityjomtien.com, secure parking.